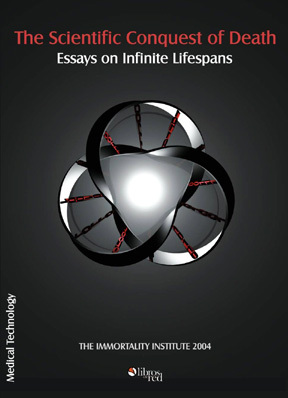 When I heard this summer that the Immortality Institute was publishing its first book, “The Scientific Conquest of Death: Essays on Infinite Lifespans,” I asked for an advanced copy to review for the Speculist. The holiday season has arrived, and with it will come higher mortality rates. For a number of reasons, including stress and cold weather, more people die around this time of year. While many accept death as a natural certainty, there is a growing movement that aims to do away with it. The mission of the Immortality Institute is to conquer the blight of involuntary death.Some would consider this goal as scientifically impossible. Some would regard it as hubris. Others say: "Don't mention the 'D–word', it will just scare people, and turn them away from the very real possibility that modern science will help us to dramatically extend our healthy life span. "What should we make of this? Is it possible that scientists – or at least humankind – will "conquer the blight of involuntary death?" If so, to what extent will we succeed? What is in fact possible today, and what do the experts predict for the future? Is such a thing as 'immortality' feasible? Moreover, is it desirable? What would it mean from a political, social, ethical and religious perspective? This book will help to explore these questions. How would this book be special?After careful consideration, the answer seemed clear: This should be the first truly multidisciplinary approach to the topic. We would discuss not only biological theories of aging, but also biomedical strategies to counter it. Moreover, we would consider alternative approaches such as medical nanotechnology, digitalization of personhood, and cryobiological preservation. But this would only be part of the whole. We also wanted to tackle some of the questions that are usually left unanswered in the last chapter of scientific books: If we accept that radical life extension is a real scientific possibility, then where does that leave us? Would it create overpopulation, stagnation and perpetual boredom? How would it change our society, our culture, our values and our spirituality? If science allows us to vastly extend our life span, should we do so? It became clear that a single author, however knowledgeable, could not possibly address this kaleidoscope of topics adequately. Thus, we decided to publish a compilation of essays. Some stem from an open call for papers, some are invited contributions by established authorities in a particular field, and a few are specially selected reprints. From among the numerous contributions, we carefully choose those the best in our eyes. Considering the multitude of topics and the quality of the submissions, it was an exceptionally difficult task. The result can only ever be a compromise. A compromise between conveying scientific information adequately, and accessibility to the lay reader; between philosophical depth, and the desire to stress relevancy; and, of course, between limitless curiosity, and the very limiting constraints of space. We hope that you like the result. 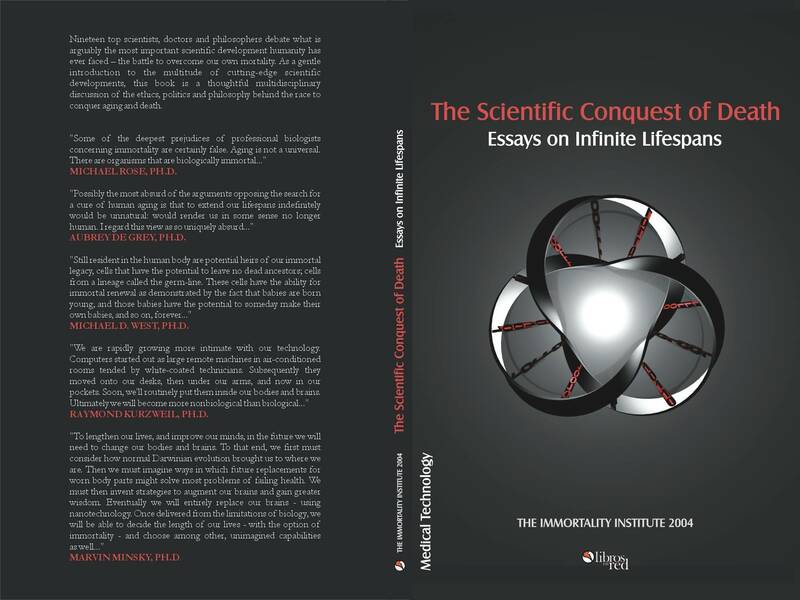 This book is divided into two sections: science, (including biology, biomedicine, nanotechnology, digitalization and cryonics) and perspectives (including literature, history, philosophy, sociology and ethics). This is not a strict division, as scientific possibilities are the starting point for all philosophy, and, in turn, the scientists in this book are not blind to the philosophical implications of their work.All essays are followed by their relevant citations. All web hyperlinks are valid as of April 2004. Please do not hesitate to call the Institute if a link is out of date, as we might be able to help chase it down. Please also note that the Institute provides additional graphics, charts, and other relevant material online and free of charge to all purchasers of this book. This book concludes with remarks, an extensive bibliography for further reading, information on the contributing authors, and a few words of thanks. But – as we shall soon learn – there is no time to waste: Follow us into an exploration of the scientific conquest of death.The road to immortality is just the turn of a page away. We start, as is proper, by defining the subject matter. What is immortality? How can we define it in a scientifically sensible manner? Is immortality even biologically possible? These and other questions will be addressed in "Biological Immortality" by Michael R. Rose, Professor of evolutionary biology at the University of California, Irvine and author of Evolutionary Biology of Aging, a book that created a complete departure from the views that had dominated the field of aging research since the 1960's. We will learn that far from being a scientific impossibility, there are now good reasons for thinking that biological immortality is fundamentally possible.If aging can, in theory, be conquered – how would, how should we go about it? Aubrey de Grey, an authority in the field of anti-aging theory from CambridgeUniversity, outlines a general strategy for proceeding with "The War onAging." In his essay, Aubrey de Grey touches on numerous issues, bothscientific and societal, that will be taken up later in the book After these introductions, we move to consider individual aspects of this strategy. Firstly, on the biomedical side, microbiologist João Pedro de Magalhães provides a summary overview of how "The Dream of Elixir Vitae" might be realized. One of the most topical and promising approaches to extending healthy life span is stem cell tissue engineering. Michael West, president of Advanced Cell Technology and one of the "founding fathers" of modern stem cell research has written "Therapeutic Cloning." It gives us an exciting insight not only into the scientific background, but also into his very personal experiences and hopes in relation to the conquest of death. While stem cell research is still an immensely dynamic field, we have recently seen the emergence of another exciting area of potential anti-aging treatments: "Nanomedicine" – the science of creating medical devices through nanoscale and eventually molecular manufacturing – has received intense media scrutiny and generous public funding in the US and Europe. Robert A. Freitas, a true pioneer in this area, describes how tiny machines could be effective in the conquest of death. As a special bonus, a second part of this chapter, including numerous illustrations, is published online.Once inspired to consider molecular-sized machines, we are not limited to healing and repairing our aging bodies: Ray Kurzweil, well known futurist and the recipient of the 1999 US National Medal of Technology introduces us to "Human Body Version 2.0," where advanced technology constructs and defines the very substance that we are made of.This introduces a second vision of immortality, one that ventures beyond biology. Dr. William Sims Bainbridge, Deputy Director for the Division of Information and Intelligent Systems at the National Science Foundation, considers how digital information about personality, feelings, likes and dislikes can be recorded. By archiving the uniqueness of a person, we might achieve some "Progress toward Cyberimmortality." But can we be more ambitious? Will we one day be able to copy our 'selves' onto a computer? "Will Robots Inherit the Earth?" asks Professor Marvin Minsky, who in 1959 co-founded what became the MIT Artificial Intelligence Laboratory. He proposes humankind will indeed leave behind the constraints of biological mortality – not only conquering death, but also expanding in consciousness. "All very well," one might contend. But will these predictions come true within our own life spans? For those who seek to conquer death, dreams of a distant future might not suffice. However, Dr. Brian Wowk, physicist and cryobiologist introduces us to "Medical Time Travel" via cryopreservation – the science of maintaining the human brain until the scientific predictions that we were considering in this section have indeed come to pass. Creating a complete departure from the views that had dominated the field of aging since 1960, Dr Rose published Evolutionary Biology of Aging after fifteen years of research with the fruit fly (Drosophila melanogaster). Biological Immortality "Some of the deepest prejudices of professional biologists concerning immortality are certainly false. Aging is not a universal. There are organisms that are biologicallyimmortal..."
Aubrey de Grey, Ph.D. Research associate in the Department of Genetics at the University of Cambridge, Dr de Grey’s main focus is to expedite the development of a true cure for human aging. The War on Aging "Possibly the most absurd of the arguments opposing the search for a cure of human aging is that to extend our lifespans indefinitely would be unnatural: would render us in some sense no longer human. I regard this view as so uniquely absurd..."
João Pedro de Magalhães, Ph.D. Postdoctoralfellow in the Department of Genetics at Harvard Medical School, Dr. deMagalhães is a microbiologist studying the biology of aging as itrelates to cellular senescence, the telomeres, stress-responsemechanisms, and Werner’s syndrome. The Dream of Elixir Vitae "The ultimate aim of research on aging is to create what David Zindell called “Godseed”: a molecular entity capable of reversing the molecular and cellular changes that occur as we age and changing the genome of our cells to prevent aging from happening again..."
Michael D. West, Ph.D. President of Advanced Cell Technology in Worcester, Massachusetts, Dr. West has business experience in age-related degenerative disease, telomerase molecular biology, and human embryonic stem cells. Therapeutic Cloning "Still resident in the human body are potential heirs of our immortal legacy, cells that have the potential to leave no dead ancestors,; cells from a lineage called the germ-line. These cells have the ability for immortal renewal as demonstrated by the fact that babies are born young, and those babies have the potential to someday make their own babies, and so on, forever..."
Robert A. Freitas Jr., J.D. Senior Research Fellow atthe Institute for Molecular Manufacturing, a molecular nanotechnology thinktank in Palo Alto, California, Freitas was the first to publish a detailed technical design study of a medical nanorobot in a peer-reviewed mainstream biomedical journal. Freitas and is the author of Nanomedicine, the first book-length technical discussion of the medical applications of nanotechnology and medical nanorobotics. Nanomedicine "Each year, medically preventable natural deaths impose terrible costs on humanity, including the destruction of vast quantities of human knowledge and human capital. Future medical technologies, especially nanomedicine, may permit us first to arrest, and later to reverse, the biological effects of aging and most of the current causes of natural death, severing forever the link between calendar time and biological health..."
Raymond Kurzweil, Ph.D. Recipient of the 1999 National Medal of Technology, Kurzweil is the principal developer of the first omni-font optical character recognition, the first print-to-speech reading machine for the blind, the first CCD flat-bed scanner, the first text-to-speech synthesizer, the first music synthesizer capable of recreating the grand piano and other orchestral instruments, and the first commercially marketed large-vocabulary speech recognition. Human Body Version 2.0 "We are rapidly growing more intimate with our technology. Computers started out as large remote machines in air-conditioned rooms tended by white-coated technicians. Subsequently they moved onto our desks, then under our arms, and now in our pockets. Soon, we'll routinely put them inside our bodies and brains. Ultimately we will become more nonbiological than biological..."
William Sims Bainbridge, Ph.D. Deputy Director for the Division of Information and Intelligent Systems at the National Science Foundation, Dr. Bainbridge has written fourteen books and numerous book chapters and articles concerning science, sociology and advancing technology. Progress Toward Cyberimmortality "Advances in information technology are essential for most of the imaginable means for achieving immortality, and fundamental to many. Before nanoscale robots are sent into a person's body to repair the damage from aging, computers will have to analyze what is needed and design the nanobots..."
Toshiba Professor of Media Arts and Sciences, and Professor of Electrical Engineering and Computer Science, at the Massachusetts Institute of Technology, Professor Minsky has made many contributions to AI, cognitive psychology, mathematics, computational linguistics, robotics, and optics over his career. In 1959, Minsky co-founded what became the MIT Artificial Intelligence Laboratory. Will Robots Inherit the Earth? "Everyone wants wisdom and wealth. Nevertheless, our health often gives out before we achieve them. To lengthen our lives, and improve our minds, in the future we will need to change our bodies and brains. To that end, we first must consider how normal Darwinian evolution brought us to where we are. Then we must imagine ways in which future replacements for worn body parts might solve most problems of failing health. We must then invent strategies to augment our brains and gain greater wisdom. Eventually we will entirely replace our brains – using nanotechnology. Once delivered from the limitations of biology, we will be able to decide the length of our lives – with the option of immortality – and choose among other, unimagined capabilities as well..."
Brian Wowk, Ph.D. Physicist, cryobiologist, and Senior Scientist at 21st Century Medicine in Rancho Cucamonga, California, Dr. Wowk focuses on low temperature preservation of tissue and organs for medical applications. Medical Time Travel: A Question of Science "Clinical medicine is now able to 'turn off' people for more than an hour with no heartbeat or brain activity for certain surgical procedures. Scientists are also on the verge of being able to preserve individual organs indefinitely by using a new ice-free preservation method called vitrification. Animal brains have resumed function after as long as seven years of frozen storage. Could human life be preserved in an arrested state for years or decades instead of hours...?" We could end it here. The scientific story has been told, the experts have made their predictions, and the options have been presented. But the Institute's mission has always been more encompassing. Many questions have been brought up: About what it means to be human, about what it means to be mortal; about the society of the future and the dreams that shape it today. In this section, we will encounter those who are enthusiastically supportive and those who are deeply skeptical of the quest for immortality. But this section is not just about moral wrongs and (human) rights. We are also asked to consider deeper philosophical questions about time, identity, and our outlook on death and life.We begin with "Some Ethical and Theological Considerations" by Brad F. Mellon. The editors must confess that in light of the recent statements made by the US President's Council on Bioethics, we were pleasantly surprised to encounter such a measured and thoughtful analysis of the relationship between Christianity and the scientific conquest of death. In concluding, Mellon leaves us with at least two questions: Why should we fear death and should we spend resources more wisely? The latter question is often paraphrased as a Malthusian concern about limited resources. Surely there are too many people already? Yet, immortalist philosopher and founder of the extropian transhumanist movement, Max More, argues that "Superlongevity without Overpopulation" is entirely feasible.Another instinctive objection to the scientific conquest of death is to claim that dying is, after all, natural. Businessman and activist Mike Treder takes issue with the contention that this is "Upsetting the Natural Order." He sees death as an evil to be eradicated, and the desire for immortality to be far from unnatural – as do many of our scientific contributers. Eric S. Rabkin, Professor of English Language, examines the way in which the human struggle for immortality has been represented in literature. In a thorough and insightful investigation he comes to conclude that desire for immortality is "The Self-defeating Fantasy". Opposing the preceding author, who advocates the expansion of consciousness by merging digital selves into 'super-beings,' Rabkin warns, "Who would choose such a neutered eternity? "We can see that there is another dimension in the discussion of life span: identity and its conception. Dr. Manfred Clynes leads us in a challenging discussion on "Timeconciousness in Very Long Life." If the time we experience is more important than the length of time we live, how would it alter our identity if we were conscious of time in a different way? After such abstract excursions, some readers will no doubt be pleased to come upon an essay by a true 'identity' who is by no means "neutered": Shannon Vyff, mother of three, is a real life immortality advocate who practices caloric restriction, is signed up for cryonic suspension and lobbies for life extension research in her spare time. In her "Confessions of a Proselytizing Immortalist" she shares her own story, thoughts and experiences. But should someone like Shannon really call herself an 'Immortalist?' Ben Best, President of the Cryonics Institute, himself a firm advocate for conquering death, feels there are "Some Problems with Immortalism." Immortality is an inconceivably long time, after all. Should those wishing to conquer death not just focus on extending the human life span? "On the contrary," replies Marc Geddes. In his "Introduction to Immortalist Morality" he develops an argument from moral philosophy, grounding moral theory on the human perception of death and the desire for immortality. Geddes also debunks the commonly held notion that our mortality is what makes life worth living. This leads us to the last essay in this section, which returns to the first question raised by Chaplain Mellon: All this talk of scientific immortality notwithstanding, why "Should We Fear Death?" Australian writer Russell Blackford examines Epicurean and modern arguments concerning this issue. His statement "We should not console ourselves with false reassurances about the supposed virtues of being mortal” brings a conclusion to this second section. Brad F. Mellon, Ph.D. With a Master of Divinity degree from Biblical Theological Seminary and a Master of Sacred Theology degree, Dr. Mellon became involved in postgraduate work at Dropsie University, and satisfied the requirements for the Doctor of Philosophy in Hermeneutics at Westminster Seminary. Mellon has served as a pastor, educator, chaplain and has presented papers and workshops in bioethics and biblical studies. Some Ethical and Theological Considerations "The Immortality Institute is dedicated to the goal of achieving physical immortality through its stated mission to overcome involuntary death.This paper will explore some of the ethical and theological considerations that in our view need to be clearly understood in undertaking such an ambitious project..."
Max More, Ph.D. Founder of the extropian transhumanist movement, Dr. More is Chairman of the Extropy Institute and Director of Content Solutions at ManyWorlds, Inc.
Superlongevity Without Overpopulation "The prospect of living longer appeals to many people. Extending lifespan more drastically beyond the current genetic limit of 120 years appeals especially to persons of independent mind. These are people used to going their own way, questioning traditional beliefs, and asserting their values independently of those around them. Yet even we independent thinkers are social beings..."
Mike Treder Business professional with a background in technology and communications company management, Treder serves on the Board of the World Transhumanist Association and is President of the Center for Responsible Nanotechnology. Upsetting the Natural Order "In the time that it takes you to read this sentence, at least 10 real people will die, some of them helpless children, and some in horrible pain. Every single day 24,000 people die of starvation; 6,000 children are killed by diarrhea; 2,700 children are killed by measles; and 1,400 women die in childbirth..."
Professor of English Language and Literature at the University of Michigan in Ann Arbor, Dr Rabkin is a teacher known for his lecture courses on science fiction and fantasy, and for his teaching innovations, including the development of the Practical English writing program. The Self-Defeating Fantasy "On the day jazz great Duke Ellington died, John Chancellor began his nightly television newscast by saying that 'Edward Kennedy 'Duke' Ellington died this morning of cancer of the lungs and pneumonia. Later in the program we'll hear him play for us'. Idealized in stone or vinyl, the great achieve immortality not in themselves but only in their leavings, an immortality that supplants, and hence defeats, the self..."
Manfred Clynes, Ph.D. During a presentation at NASA conference in 1960, Professor Clynes coined the term “cyborg”, combing the two terms cybernetic and organism, as a concept for humans to survive space travel. Time Consciousness and very Long Life "In these talking points to follow, I will leave immortality to the Good Lord, and will try to be absolved of some hubris by dealing with individual life of only a few million years long. I hope not to disappoint readers through this, at least not for their first million years. What is time...?" Shannon Vyff A student residing in Eugene OR and mother of three children, Vyff is a member of the Caloric Restriction Society and the Immortality Institute. She, her husband and three children are signed up for cryonics with Alcor Life Extension Society. Confessions of a Proselytizing Immortalist "Why Immortality? Isn’t that selfish? Doesn’t God/fate/evolution tell us when to die? -- I hear this all the time shortly after I meet people-- at church, on vacation, in buses, in line at the grocery store, at parties, at family gatherings--It all begins like a perfectly normal conversation with questions of the weather, or what the person has been doing for the day..."
Ben Best President of the Cryonics Institute based in Clinton Township, MI, Best has published numerous articles concerning science, life extension and cryonics. Some Problems with Immortalism "Although I place no limits upon how long I want to live, I believe that there are good reasons for believing that immortalism is an unrealistic goal -- and even a self-defeating goal. "Forever" is not just a long time, it is eternity and therefore beyond realistic conception. Yet there are mathematical models which can be used for calculating valuations in infinite time..."
Marc Geddes Free lance writer from Auckland, New Zealand. Mark is a member of the World Transhumanist Association and the Immortality Institute. An Introduction to Immortalist Morality "The desire for immortality is one of the deepest, most enduring dreams of humanity. But is it a noble dream? Advanced technologies such as Bio-tech, Nano-tech and Info-tech appear to hold great promise for extending human life spans and restoring youth at some point in the not-too-distant future. But even assuming that radical life extension is possible, some people find the idea disturbing..."
Russell Blackford, Ph.D. Australian writer based in Melbourne Australia, Blackford’s non-fiction work frequently deals with issues involving science and society, particularly bioethics, cyberculture, and the history and current state of the science fiction genre. Should We Fear Death? Epicurean and Modern Arguments "Most of us fear death, to a greater or lesser extent, though some philosophers believe that we would do well to accept it and to fear any prospect of immortality...I argue that it is rational to be attached to life and live as long as we can, though not to fear death with the intensity, or nagging anxiety, that human beings often do..."
Nick Bostrom, Ph.D. British Academy Research Fellow at Oxford University, Dr. Bostrom is co-founder of the World Transhumanist Association and has a background in physics, computational neuroscience, artificial intelligence, and philosophy. Who wants to live forever? "For those rooting for a breakthrough in life extension research, to question why it would be desirable to lead a longer and healthier life might seem banal. investigate any of the topics raised, starting with the selected references in the bibliography. learn a bit more about the numerous authors and their work. visit us, to learn more and to share your views on the exciting project that is the scientific conquest of death. Carey, J. R; Longevity : the biology and demography of life span. Princeton, (2002); Princeton University Press. International Association of Biomedical Gerontology. Interna-tional Congress (9th : 2002 : Vancouver B.C.) & D. Harman (2002). Increasing healthy life span : conventional measures and slowing the innate aging process; New York Academy of Sciences. International Association of Biomedical Gerontology. (2001) & Park,S. C. ; Healthy aging for functional longevity : molecular and cellularinteractions in senescence. ; New York Academy of SciencesKomender, J;"Stem cell research as a base for reconstructive medicine" in: Annalsof Transplantation (2003, Vol. 8); pg. 5–8Lo, KC & Chuang, WW &Lamb, DJ; "Stem cell research: the facts, the myths and the promises"in: Journal of Urology (2003, Vol. 170); pg. 2453–8Toussaint, O.;Molecular and cellular gerontology; New York Academy of Sciences. United States Congress, Senate. Special Committee on Aging: Allhearings; For sale by the Supt. of Docs. U.S. G.P.O. Congres-sionalSales Office. The Institute represents the tip of the sword in the life extension movement by advancing its mission to "conquer the blight of involuntary death." With a number of projects and a growing worldwide membership base, the Institute has blossomed in scope and scale since its inception in 2002. As a non-profit educational organization, the Institutes' success rests fully on the backs of a highly motivated and totally volunteer support team. Online since May 2000 and (according to traffic-ranker Alexa) in the top position among e-book publishers and sellers in Spanish. 350,000 registered members receive LibrosEnRed's monthly newsletter. Books are published both in electronic formats (as e-books) and in paper (using a print-on-demand system). They are sold in our virtual bookstore, in 300 affiliate sites, and through Amazon.com and BN.com. Many thanks to the online community of the Immortality Institute for encouragement, critique and many valuable suggestions. Special thanks to Michael Anissimov, Justin Corwin, Kevin Perrott, Kenneth X. Sills and Don Spanton for their help and advice. Warm thanks to the authors who have agreed to forego all potential revenue from this publication for the benefit of the Institute.